The best gift you can give is a hug: one size fits all and no one ever minds if you return it. I have a huge problem. No, not my ego. Despite my social skills, or rather the lack of it, I get invited to parties at times. That, though, is the not the problem. My problem is that in those few occasions that I get invited, I am expected to take gifts. And that is a big chink in my otherwise strong armour. Gifting is an art. And like all art, there are artists and then there are wannabes. Unfortunately, I fall in the latter category in the art of gifting. It is a pity, considering that I do give it a lot of thought, and mostly rational. I don’t like to buy a gift that is useless or is thrown away after couple of days. So before buying a gift for someone, I think about all the things the person needs and does not have. This works like a charm because you will invariably find that the person has all the things he needs (he would have already bought things he needed). And in those rare circumstances when he does not have it, you will find the thing either not affordable or not available. Either way, you can get away without buying a gift and not feeling guilty about it. On our last wedding anniversary (I guess it was the seventh or eighth, I forget. Some things are better forgotten. ), I gifted my wife a diamond ring. She actually wanted one of those sporty four-wheel-drive vehicles, but I could not find a fake one! When she had asked for something that goes from 0 to 200 in 6 seconds, my initial thought was to buy her a weighing scale. I intend to get her something with diamond next year too (remember, they are a woman’s best friends). I plan to buy her a pack of playing cards, which if I remember right has 13 diamonds in it. Scott Adams (of the Dilbert fame) said that anything that has enough mass to displace water is a ‘gift’. But from real-life experience, I have found that people like gifts that displace A LOT of water. If you don’t like the person who invited you, you could always buy a very large-sized gift, but still cheap and useless. If you don’t like the person and you are sure you will not meet him again, you may even try gifting an empty box with no name in it. But remember that it may backfire, if you are the only person who did it. Gifts speak a lot about the personality of the person gifting. Gifting a condom on friend’s marriage shows that the person has a whacky sense of humour and is not a conformist. Gifting a live frog to your boss on the office party shows that the person has great courage and is a risk-taker. A plain gift card shows that the person is unimaginative and risk-averse. People think that one of the safest gifting techniques is to buy something that can be hung on the wall or displayed in a room. But in reality this approach is full of risk because it assumes that the person has enough space in his wall/rooms for all the gifts that he will receive in the party and that the gift would go with the theme of the person’s wall/house. 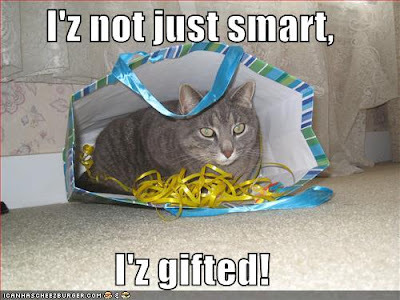 By the way, I was told that everyone is gifted - but I guess some people never open their package! Women have an advantage over men in gifting – they get to buy the gift and also enjoy the process of shopping for it (if you recollect, I suffer from Shopophobia Mallfeorosis). On that note, it is said that women are god’s gifts to men – god must really love gag gifts! And if the invitee is a woman, I was told that the best option is to gift flowers. However I learned that if you want to say it with flowers, a single rose says: "I'm cheap!" Notwithstanding all my troubles of trying to buy (and end up not buying) the ‘perfect’ gift for others, I try to keep things very simple when it comes to receiving gifts. People who do not bring gifts don’t get invited to my next party. And my best friends are those who give me the most expensive gifts. Somehow, I have always felt that a gift watch shines so much better than the one I bought for myself. And guess what has been the greatest gift I have ever received? - Readers like you! Lol! ROFL! HA HA HA HA HA HA HA HA HA HA HA HA HA! "On our last wedding anniversary (I guess it was the seventh or eighth, I forget. Some things are better forgotten. ), I gifted my wife a diamond ring. She actually wanted one of those sporty four-wheel-drive vehicles, but I could not find a fake one! When she had asked for something that goes from 0 to 200 in 6 seconds, my initial thought was to buy her a weighing scale. I intend to get her something with diamond next year too (remember, they are a woman’s best friends). I plan to buy her a pack of playing cards, which if I remember right has 13 diamonds in it." Salil, this is gonna cause you some very serious trouble for you have made some very serious pointers in those lines! Don't worry, I'll pray for you! And on a serious note, thanks very much for the last line...... Absolute pleasure! By the way, I was told that everyone is gifted - but I guess some people never open their package! I liked that one...another of your hilarious thoughts on life's little stupidities..enjoyed it a lot!! wow Salil:) you sense of humour is great all the time:)...I just wonder how your wife takes it? or better still shake hands before you depart. Thank you for that :) and for the line at the end, and also for all that is there in the post! Gifting truly is an art, and the what and how of it have been entertainingly articulated here! you truly are a gift to the humor nerves in many of us.. good post..
you are married to a forgiving lady; u r far away in a beautiful place enjoying other beautiful ladies; Salil man, u r gifted. hehehe!! ROTFL indeed!! loved de post..n de scale..lolz...i'd love to see ur wifez expression readin that..n even better- yours maybe :P hehe!! nice post! n yeah the content too, well laced wi all the humor..loved this! the opening line was mine...can i have a chunk of the royalty please? I have a terrible time chosing gifts for people.theres too much choice these days and people have everything that you can think of. L.O.Loudest at the last line. You could gift someone this post. It's a gem in itself. Great post. And so true. I know a family that received 11 milk boilers at their wedding. I am so glad that item got obsolete! And now with video recordings of events, it is impossible to gift without the name and hope they would not find out! Actually cats are not a bad gift idea, as long as the receiver is not a mouse. Well, she has already learned and reconciled to the fact that the diamond ring is fake (like me). I meant what I said in the last line. Appreciate readers who return. You thought it is one of life’s stupidities, eh? For me, it is a shameful confession. But I still can’t believe you did not go and watch IPL, living in Pretoria. Yeah, I agree. If only I could write poems like you, I would have started gifting those. Thank you for your kind comments. Chirichu mannu kappiyo? So are you suggesting that I get on your nerves? Gifted, thank you, yes, I am, though may not be in the positive way. But was the rest of the comment warranted? Btw, I am meeting Jenna on Saturday and Leah on Sunday. Maria has still not returned my call and Lori said she will reply to my mail tomorrow. I am confiding all this to you assuming you will not disclose this on a public forum, such as the comments section of my blog. My worry is not the consequences when my wife reads my blogs, but whether she is writing blogs where she writes such niceties about me (which “obviously” will be false). Nice to hear from you, the man of few words. Thanks for your kind words. Maybe I should get this added in gifting ideas. You cannot have a cut of the royalty. But what you have to do is contribute to the reward I have offered to the readers! Forget the last line, I have given you a clue on how to become my best friend in the last paragraph. Why don’t you give that a try? I have used that before, when I gifted my wife a blog on our last wedding anniversary - http://www.salilravindran.com/2008/09/memory-is-what-tells-man-his-wedding.html. I found that very cost effective. I also received milk boilers as gifts on my wedding, apart from all the flower vases, clocks, etc. They were all gifted away over so many years. hahahah....How do you think so twistedly straight, Salil?? Sal, you go from strength to strength in every post that you send our way. ROFL! Man, i loved the Kerala gift clock part! I was sharing the joke with my rommies and they bursted into laughter... Applause!!! Right now, that Kerala clock is with me, waiting to resume its travels. And the last sentence! good to be considered better than expensive watches. Next time - try this - get the host a nice potted plant. If the host cares for you, that gift should keep growing! Aha! Buttering up the readers with that finishing line eh Salil??!! But actually I am rotflol @ I think there is only one gift clock in Kerala, and people keep gifting it to each other. Never heard a truer word!! How did you wife let you go off the hook after you presented her a fake diamond...!!!!! I have just got your blog in my favorite blogs list after this post!!!!! Thank you for your abso-mindblowing-lutely wonderful comment. Well, since I live on bread and butter, buttering up comes naturally. Btw, do you know when do clocks die? When their time is up. Thank you for leaving your footprints. What gives you the impression that I have been let off the hook? Normally, when you buy something, you pay upfront and that’s it. But in this case, I am still ‘paying’ for than diamond ring. That was simply lovely, Salil!!! Am happy that atleast you "gifted" a diamond ring to your wife on your what you dont know wedding anniversary.. Happy not that it was a diamond ring but that you remembered when your wedding anniversary is ! If my memory is right, you and Ambika lived for a day without each other after two years of your marriage. Then, your sense of humour was not that good.. Now, being alone, I think you are putting your brain to good use ! Keep it up !!! ROFL! And still ROFL! What a gift-ed blogger you are! Keep writing! Hey Long time no posts!!!! Wow....I have not seen any research topic that speak lots about "Art of Gifting". It was interesting to read through out. Keep Posting. "On our last wedding anniversary (I guess it was the seventh or eighth, I forget. Some things are better forgotten. ), I gifted my wife a diamond ring. She actually wanted one of those sporty four-wheel-drive vehicles, but I could not find a fake one! " This one made me laugh out loud. ROFL. You are a 'gifted' writer.